I was supposed to run an entertaining guest post today, but I had to pre-empt it due to last night's announcement of Osama bin Laden's death. Below, you will find my general thoughts on the past ten years with Osama bin Laden prominently in our lives. I wrote this post before I found out that you can see the pictures of Osama bin Laden's face post-gun shot online. That would've gotten its own paragraph. Like most people who graduated college after 2006, there was a period of time when I lived at home with my parents. When I was home, I worked in my dad’s warehouse. I had worked there when I was in high school, but that was mostly menial labor so that I had enough money to take girls out, pay for gas and buy beer. During my stint after college, I took on more substantive work helping my dad reorganize and restructure the warehouse as well as re-imagine the workflows for many different facets of the day-to-day operation. After a day of work, I’d chug a cup of coffee on the ride home from work and listen to music (Dion’s Born to Be With You and Feels and Strawberry Jam by Animal Collective mostly). At home, I’d eat dinner with my mom and then watch Pushing Daisies or Dancing With the Stars in order to spend time and talk with her. Then, I’d retire to my room with a high ball of whiskey and do my writing for the evening until my dad got home from work at about 11:00. Once he was home and eating the warmed up leftovers from dinner, he and I would rehash the day at work. I’d give him feedback and my ideas while he looked through the paper or watched Fox News. He’s said those same sentences in various ways over the years, but as I’ve come closer and closer to being an adult who should care more about the civic duties each individual carries, something about that phrase has put me at ease. Perhaps its because even though I may know so little about a current event or about the nature of trends in the stock market, I can still try to know what makes me happy and what makes others happy, and I can still try to figure out what it means to go home. September 11, 2001 was my 16th birthday. My main concern on that day was the fact that I didn’t feel like going to soccer practice after school. Then, the World Trade Center was attacked by planes and crashed to the ground killing thousands of innocent people as well as destroying one of the monuments to our great country and its place at the forefront of world power, technology and economy. A distant relative, not blood related, was an officer in the NYFD. He died in the initial firefight at Ground Zero. A few weeks later I went to his funeral and felt sad that he was a person who had died and thankful that he had put forth such a strong effort in caring about the actual world—a feat I could only barely imagine as a teenager with creative aspirations. That’s the closest that 9/11 ever affected me. I lived far enough away from New York City, obscured by the historical locations and wealth of my Long Island hometown, that none of the initial fallout or fear truly impacted my day-to-day life. The year after 9/11, I wrote a poem that I read in my English class reflecting on the tragedy a year later. However, that impulse was born more out of a desire and vanity to prove myself as some eccentric sage of my high school rather than out of mourning. As years passed, people wrote novels and were on TV or in magazines telling me about the post-9/11 world. However, despite increased airport security and fear monitors, the overall world never seemed to change. Maybe I took these small changes for granted as they seeped into my existence, but overall things didn’t change. People asked me what it was like to have a birthday on 9/11, but all I could tell them was that 9/11 and the date of September 11 are two completely different objects and that one didn’t necessarily interact with other. My birthday still came every year, I tried to enjoy it and measure my accomplishments, and at the same time we memorialized 9/11, which was something entirely separate from me. George W. Bush’s White House was able to capture Sadaam Hussein, who was one of the villains we went after along with Osama bin Laden after 9/11. We tried Sadaam Hussein in a court proceeding and then presented his execution on TV. I watched it all during one winter break from college while I sat at a bar. College passed and I graduated and then, once I was done living at home with my parents, I moved into an apartment of my own, where I have lived for three years, fallen in and out of love and other little infatuations, changed jobs, have acted selflessly and selfishly towards friends and tried to become an artist. Last night, during a Mets vs. Phillies game I was watching on ESPN, I learned that U.S. Special Forces had killed Osama Bin Laden. I watched as the camera showed different shots of fans at the game looking at their Blackberries and iPhones to get the latest news. I was reminded of a friend who said that Gary Shteyngart’s Super Sad, Super True Love Story was a scary vision of where our world was headed or might already actually be. As I watched these images at the game, I thought of the book and how it was probably a bit overrated. But I also thought of the apparats that the characters used in the novel to share information and look into the lives of others and thought that this moment more than any other seemed to validate Shteyngart’s vision. So, I silently gave him credit. My roommate and I watched Obama give his speech and we murmured about how crazy it was that Osama was dead and that he’d sort of fallen off our radar in recent years. We joked that Ghaddafi had stolen his thunder as of late. We held back making more jokes. Then, as Obama’s speech concluded, my roommate said. The speech ended and Obama thanked God and asked for God’s blessing on America, which made me think of Shakespeare’s history plays. 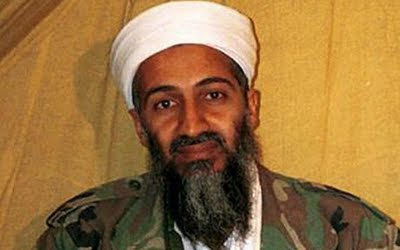 As CNN looped old footage of Osama, one image struck me. It was a video of Osama walking in some dark stretch of desert. His eyes are wide and he has a slight grin as he walks towards the camera and then disappears under the lens. Then in the background, some of his Al Qaida comrades walk with guns and above them, tracing rounds of light fly in multiple directions and against the darkness of the desert sky, they look like stars for a moment. That looped video made me think of the darkness of night for a U.S. soldier in the desert. And there were a lot of troops out there or in Iraq who spent nights in the desert probably scared or angry. Some of them went to my high school. And even though much of this decade of foreign affairs didn’t affect me personally on any large scale, it affected them and lots of other people in dire and visceral ways. So, maybe chanting “USA,” during a baseball game is an appropriate release. I watched the shots fly and disappear in the blackness of that looped video and then decided I would go to bed. Shelbyfero: And TOMORROW we get to all meet back, when Obama announces Osama Bin Laden jokes are dead. These people are complete strangers to me; two funny girls who handle Twitter accounts that I read. Two Twitter accounts that I’m happy exist. I closed Twitter, put on a Bill Simmons podcast and drifted off to sleep. When I remember May 1, 2011, there will be an object of May 1, 2011 that will solely be the day that Osama Bin Laden was killed, was shot in the head and then later buried at sea. A day where a Phillies vs. Mets game on ESPN featured a unified “USA” chant. A day when people gathered outside the White House in Washington D.C. and cheered from trees and stood on shoulders in some sort of unity. Not for what was to come but for some kind of closure for what happened. For the happiness that the death of one human being brought—that object is profound, thought-provoking, scary and just. However, May 1, 2011 will also be another object. It will be a day where I woke up and bought groceries; where I made Mexican pulled chicken for the week because I knew I’d be working late; where I got a huge Italian hero from the local butcher shop and deli for lunch; where I did my laundry; where I watched the Thunder play the Grizzlies in an immensely enjoyable Game 1 of the Western Conference Semifinals; where my friends came over and we barbequed burgers, sausage patties and swordfish while drinking beer and watching the Heat and Celtics start what will be a classic playoff series; where two of my closest friends and I watched The Money Pit on a Netflix account routed through a Wii; where I read funny twitter messages. I did all that on the day that Osama was killed. I didn’t do any bit of my civic duties, but I tried to be happy and make others happy and I tried to make my apartment into something that could be termed “home” for a few hours. There’s always going to be bad guys out there and we’ll have to kill a lot of them, but at least we can figure out what makes us happy and try to get home. That’s the kind of politics I can agree with even my dad about. Long story short, you dad had a great point that I completely agree with. Thanks for the comment. It's one of the things my dad has said that I've tried to stick with and think about. "There’s always going to be bad guys out there and we’ll have to kill a lot of them"
wait, i can't tell -- was that bin laden's ethos or is it yours?